Her smile filled her face and your heart. She grinned and everyone felt the need to sing. Small in statue with straight black hair, Lorna was born with a genetic disability know as Downs Syndrome which causes developmental disabilities or mental retardation. Though she was not a quiet person–jabbering, laughing and giggling–Lorna was the type of person that you could lose in an emaciated minute. Not that Lorna wandered away or was mischievously hiding, she simply seemed to evaporate into the walls. Lorna was a member of The Special Gathering Choir and I was the fledgling director. Special Gathering is a ministry within the mentally challenged community. We have eight programs dotting the eastern coast of Florida and South Carolina. We are a community-based program involved in classic ministry: discipleship and evangelism. We also feel that it is important to help educate the Church to the spiritual needs of mentally challenged persons. The choir helps to bridge that gap for us. When the choir sings in local churches, our members show that they have a valid ministry to the Church. In addition, the Church is able to witness first hand that individuals who are developmentally delayed can have a significant, growing relationship with the Lord. I came to know and love Lorna during my years as the director of her choir. I always positioned her directly in front of me, in the first row. There were several reasons. First, her amazing face and delightful smile made the choir an instant success with our audience, even before we opened our mouths. Second, her singing ability didn’t accurately match her fantastic smile. I tried to use my body to block some of the monotone chords she produced. The third reason was to help me keep track of her. It wasn’t that I ever actually lost Lorna; I just sometimes could not find her. Often, we would travel to churches in other cities or counties. We are sponsored by 60 local churches in Brevard County, Flordia. We received frequent requests to sing in churches and at community events. “Behind you” was the usual response. For me, Lorna became the hidden treasure: The great pearl that Jesus spoke of in his parables in the New Testament. In Matthew 13:44, he said, “The kingdom of heaven is like a treasure hidden in a field. One day a man found the treasure, and then hid the treasure in the field again. The man was very happy to find the treasure. The man went and sold everything he owned to buy that field. Knowing Lorna, this interesting parable came to life for me. 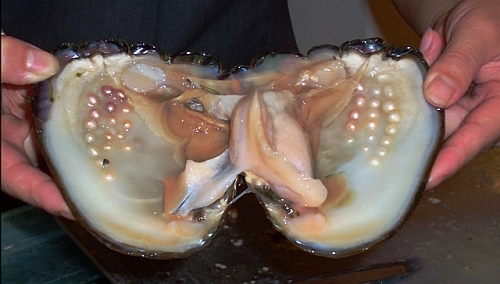 Often we speak of giving up everything to obtain the great pearl, God’s kingdom. But I came to understand that we give up nothing, but our sin and misery. It is Jesus who gave up everything to gain a treasure and a pearl that he considered more valuable than all the riches of heaven. We are his pearl of great price. For me, Lorna became a symbol of the mentally challenged community because like her, this group of people is often unseen and lost to the world. Sadly, even the church has not discovered the wondrous glamour of this great treasure. They remain a cloistered sub-culture, moving, working, play, dancing. Unseen, unknown. But Jesus knows where Lorna is. He sees and values her great worth. In fact, he gave up everything he had–even his life to possess her. Each of us has the opportunity to become his treasure. For the Bible says that all of us are of great worth to the Lord Jesus, from the greatest–such as Lorna with her big heart and wonderful smile–to the least–a silly, novice choir director who couldn’t seem to keep a finger on her greatest treasure. Have you found someone who teaches you lessons from the scriptures by the way they live their lives?